British Olympic Association (BOA) have awarded the athletes with 'Athletes of year' award in different categories this Tuesday. In a headliner, Mo Farah who won two European Gold medals has been named for track-and-field athlete of the year. Mo Farah won the 5000m and 10000m race title in Barcelona, thus he was the choice for British Olympic Association ahead of heptathlon star Jessica Ennis. 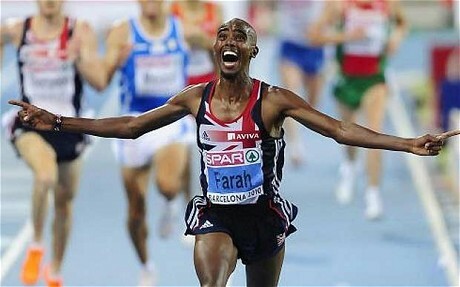 Farah's award comes after he missed out on a place in the BBC Sports Personality of the Year short-list. Whereas, Ennis finished third at the BBC awards for the second year in a row. On the other hand Adlington was named Aquatics Performer of the year for her two golds at Commonwealth games.
'' I'm proud and honoured to have won this award in 2010, given the achievements of so many British swimmers at both the European Championships and Commonwealth Games." Amongst the winners was Amy Williams who won the Winter Olympic gold medallist, whose performance in the skeleton in Whistler saw her become the first individual British champion for 30 years. Ice hockey, football and rowing are yet to announce their Olympic Athlete of the Year for 2010.